Hotel Overview A private house in the Old Town of Sozopol. Hotel Address 30 Apolonia str. We ( 2 ) would like to stay 7-9 nights in the end of august, please, send me details about prices. 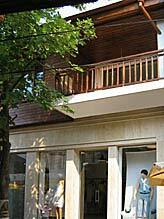 cuold you please send more details on your private lodging in sozopol.and a pric for 7 nights in july. We would like to have an offer for the period of ca.july29-ca.aug.6 for 7-8 nights. Please send me the prices and all kind of detailed inoformation about your appartment. We need apartement or accomodation for 8 persons, 2 family! For one family with 2 adults and 2 children and for one family with 2 adults and two children. I´m very interested in spending holidays with my family at your beautiful place. We would like to order 2+1 during the term from 29.7. to 05.8.2006. Please, let me know if it is possible and if the price is also including the touristic tax. If the place is free, I would like to book that. Let me know as soon as possible, please.